The former Soviet Union (FSU) is a forested region. 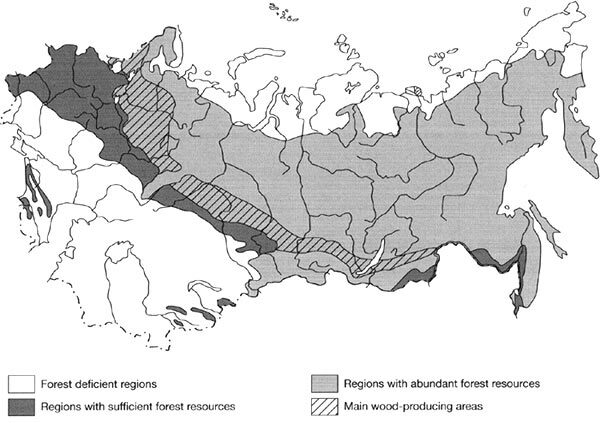 Russia contains 96 per cent of regional forest and almost two-thirds of its territory, mainly in Siberia and the Far East, are occupied by forests (Figure 23.1). Closed forests cover 756 million hectares in Russia and Russia's reserve of timber exceeds 81.6 billion m3 or a quarter of the world's total stock. The annual growth reaches 822 million m3 (Les Rossii, 1995; Novaya Rossiya, 1995). Russia possesses the largest reserves of timber in the Northern Hemisphere and its forested territory (over 20 per cent of the world's total) is larger than the forested territory of Canada, the United States, Finland, Sweden, and Norway combined. The composition of North Eurasian forests varies greatly from the typical taiga species such as larch (which occupies 258 million hectares), pine (114 million), and stone pine (37 million) to the subtropical forests of Transcaucasia. 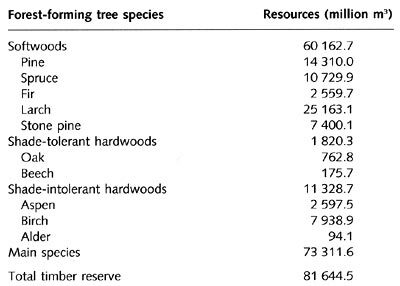 Conifers and larch, which are commercially valuable, account for 90 per cent of Russia's forests and constitute over a half of the world's growing stock (Table 23.1). For centuries the forest resources of Northern Eurasia have been treated as inexhaustible. Over much of the Asiatic territory, remote and unsuitable for agriculture, forests of exceptional scale still remain in the state of wilderness. However, it is the vastness and abundance of forest that may provoke its decline. The major problem of forest management in the FSU as Barr (1987) puts it 'seems to lie in the very size and visibility of the forest resource'. In many densely populated regions the expansion of arable agriculture and use of wood in industry and for construction purposes have depleted the forest stock and changed the distribution of forests immensely. There are two major types of changes: deforestation and degradation of forests. 'Deforestation' refers to forest clearance. The term 'degradation' is used to describe the adverse effects on forests (such as temporary clearance, modification of composition or replacement of forests by inferior woody covers) which do not involve complete and permanent clearance. Deforestation occurred in central European Russia, the Ukraine, the Volga region, in the Caucasus, and Transcaucasia mainly between the 15th and 19th centuries as more land was brought into agricultural production. In other areas with lower agricultural potential (e.g., the European north) forests became fragmented, less productive, and the most valuable species have been extracted. Forests are often valued in commercial terms. However, when discussing the role of forests in life and economy and analysing potential consequences of deforestation and degradation, various aspects of forest use, which may come under threat, should be considered. Forest has always provided food and shelter to its dwellers. Various forest products, such as berries, nuts, and mushrooms, have been important components of human diet for centuries. Many domestic plants and animals originate from forests and over 300 plant species used in contemporary medicine occur in the forests of Northern Eurasia. It has been estimated that in 1997, the forests of Russia had over 4700 tonnes of berries, 2200 tonnes of mushrooms, and 7800 tonnes of birch juice, which has been traditionally used in Russia. Forests provide habitats for animals and harbour about 100 mammal and 300 bird species. Many of these animals are hunted commercially and by the indigenous tribes. Forests play important ecological, aesthetic, and recreational roles. Its cultural importance is reflected in the languages, folklore and literature of many peoples of Northern Eurasia. The cult of sacred trees and groves still exists in northern European Russian, in the Volga and Transbaikal regions and in the Far East. Forests are closely associated with the protection of global biodiversity and maintaining environmental balance through their role in the carbon cycle. Forests account for a greater part of the carbon exchange between the atmosphere and terrestrial biosphere than any other biome. In this context, the forests of Northern Eurasia are particularly important because they cover an extremely large area and most of Siberia and the Far East accommodate virgin forests. It is, therefore, the condition and management of forests in Northern Eurasia that determines to a large degree whether the terrestrial biosphere is a net sink or a net source of carbon. At present, national and international environmental strategies are aimed at stabilization and reduction of carbon dioxide (CO2) emissions and although direct reduction of emissions from burning fossil fuel can be very expensive, forests of Northern Eurasia have a potential to be managed for the purposes of carbon sequestration.